They say that this could be Los Angeles Lakers center Andrew Bynums Nissan GT-R with a Wald Bodykit. 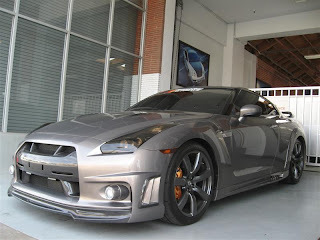 Might be..
We recently found photos of what could be Andrew Bynum’s Nissan GT-R sporting a full WALD Aerokit. Though many may criticize the look of the front bumper with fog lights, it is still consider high-quality stuff. Andrew Bynum is no small guy by any stretch, at 7-feet and 285 pounds, that’s considered pretty big in my book. When it comes time for a NBA player to pick a car this “tall-guy” picks a Nissan GT-R to put in his stable along with a slew of other autos such as a BMW M6 convertible. That same car was in front of Platinum Motorsports on Melrose a couple of weeks ago. There was a tall African American guy standing around it, but couldn't tell who it was.